Borah Peak the evening before our climb. Even though I spent several years in Utah going to college, I never took the chance to drive the 5 hours to attempt to hike Borah Peak, the highpoint of Idaho. A family reunion at (relatively) nearby Yellowstone National Park gave me all the excuse I needed to convince my brother Ian to join me in a quest to conquer this isolated and rugged peak in the Lost River Range. 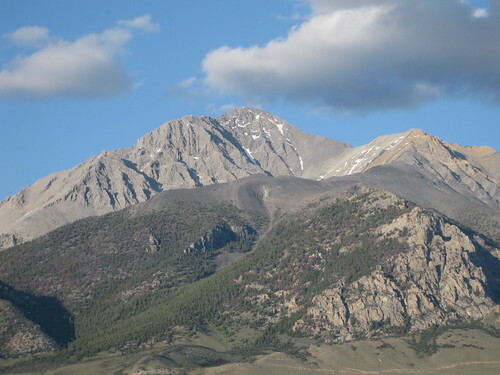 Borah Peak (named after the long-time Idaho senator William Borah) is easily accessible during the summer months, but quite a climb. The trail is only 3.5 miles long, but features over a mile of vertical gain, making for an average grade of close to 30%. Parts of the trail top off at a 40%, and there is a significant bit of exposed Class 3 scrambling. The most potent feature of the climb is the aptly-named "Chicken Out Ridge," a knife-edge scramble which often deters would be summit-seekers. The drive from Yellowstone to the base of Borah Peak isn't particularly long or arduous, so Ian and I decided to make a day of it. First stop was the St. Anthony Dunes, 11,000 acres of fine quartz sand dunes. After roaming around a bit, and a brief stop in Rexburg, we went over to Idaho National Laboratory and toured EBR-1, the first nuclear power plant in the world. As we drove around INL, we were both surprised by the barrenness of this part of the Snake River Valley. Next stop was Craters of the Moon National Monument, a vast basalt flow covering a few hundred square miles of the Snake River plain. We explored a few lava tubes, and climbed a cinder cone or two. But the thing I noticed most was the wind. A solid 20- to 30-mile-per-hour wind was blowing across the moonscape, and it got me thinking about our chances for success the following day. While a minor annoyance in the valley, a wind like that could have serious implications on a summit attempt, particularly since we had planned for a hot, still day, not a cold, windy one. After leaving Craters of the Moon, we ate dinner in the first town lit by atomic energy: the thriving metropolis of Arco, Idaho. After our brief visit, we drove up US-93 into the Lost River Valley toward our intended camping spot at the base of Borah Peak. More than 20 miles up the highway, we reached a signed turnoff for the access road, made the turn and continued driving. The sun was riding low in the western sky, which brilliantly lit up the entire mountain range. The clouds were quickly moving through the sky, just barely above the summit of Idaho. 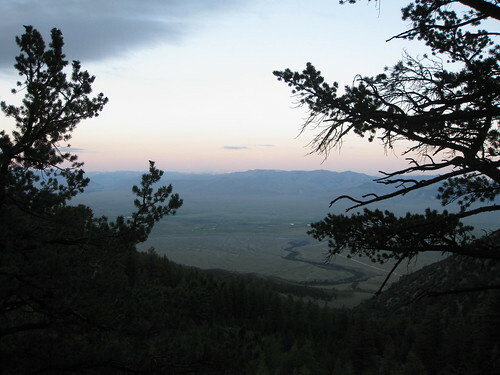 The Borah Peak trailhead has an undeveloped camp area with a latrine and a few secluded fire rings and tent pads. A couple of vehicles and their occupants were already in the area when we arrived, so we just found a suitable location and set up camp. Chatting with a few of our fellow climbers indicated that conditions that day had not been good, with high winds and a bit of rime on the rocks and around the seasonal snow bridge. My primary concern, however, wasn't the weather, but the 40% grade we would encounter on the lower slopes of the mountain—something I wasn't sure I was fit enough for. We finally settled down for a uneventful night. We woke up before first light the next morning, broke camp, and started the hike. The trail is easy to find, and immediately begins to climb up one of the mountain's lower ridges. Most of the hike is above the tree line, and we were prepared with several liters of water each. Part of the reason for the early start was to avoid the heat of the day, and the thunderstorms which often come up in the mountains in the summer. Ian bounded ahead, but the grade and altitude forced me to take a more measured pace. The sky gradually lightened as we reached the crest of our ridge, crossed out of the trees, and saw the summit for the first time that day. What we saw was not encouraging. While we were hiking up the ridge in the clear, the summit and its ridge were shrouded in clouds. At that point, I started to get concerned about the viability of our summit attempt. The wind where we were had picked up, and our preparation for a hot-and-dry day turned out to be useless below the cold-and-windy Chicken Out Ridge. 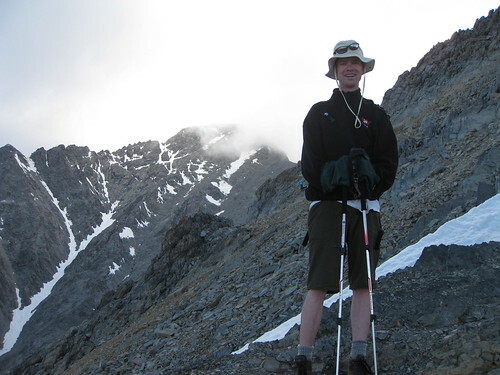 Hyrum, at the turnaround point, sporting the latest gaiters-as-gloves style. We had made it to the famous ridge, or so I thought. The trail had actually disappeared, and we spent a fair amount of time just looking for a way up our current ridge toward the summit, all while trying to stay warm. At one point, I found my Gore-Tex gaiters to be more useful as gloves than for their intended purpose. We weren't alone on the mountain, either, as we spotted a couple of climbers ahead of us, and another small group behind. In the end, we decided to turn around at about 11,400 feet. By the elevation, that would put us above the much-maligned Chicken Out Ridge, but we never felt threatened by our position on the ridge. Perhaps we hadn't reached it yet, but seeing what lay ahead in the cloudy, and potentially icy, conditions, we decided that it was wisest to pursue the mountain another day. We ate some snacks, and then began our retreat down the mountain toward the parking area. Borah Peak was a sad one to leave behind. A tough, isolated and strenuous climb which will take some work to eventually conquer, I'm glad that we decided to abandon when we did. I don't know when I'll get back to Idaho and the Lost River Range, but I do know that it will eventually happen.